Bits and pieces of Baltimore's past. Maryland History in Prints 1743-1900 by Laura Rice. 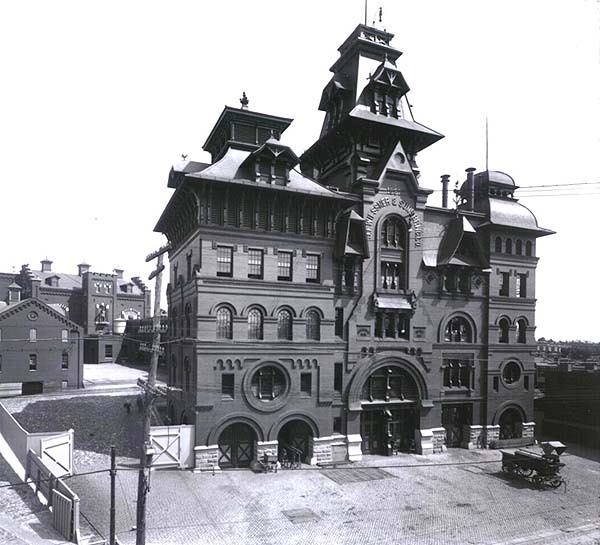 The American Brewery building was built in 1877 for the J.F Wiessner & Sons Brewing Co., and was originally one of two dozen buildings in a five-acre brewery complex. 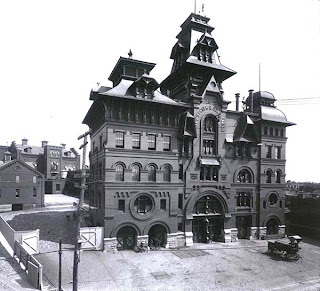 This complex replaced the original Wiessner Brewery building that was much smaller and built in 1864. The Wiessner Brewery reached its highest peak of productivity in 1919 by brewing 110,000 barrels of beer that year. They employed 61 people and they had competition just down the street. Both Wiessner and Bauernschmidt had erected modern breweries around the same time, both said to be "show places" of their time. The modern ice machines in these two breweries were the first of their kind in Baltimore. These two breweries brought employment and vitality to the neighborhood by bringing immigrants to the states for employment. 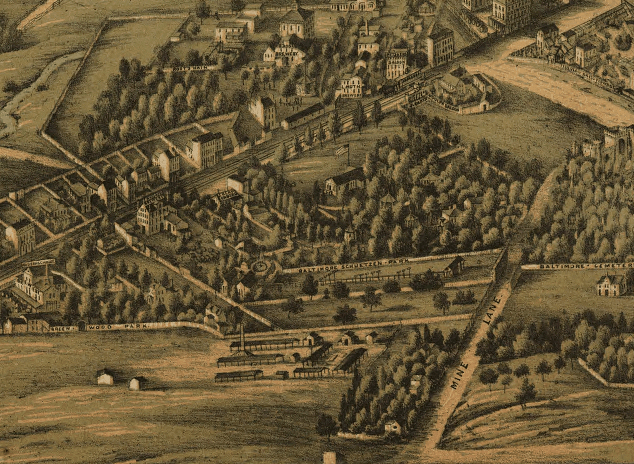 In the 1850s, German immigrants established a shooting club, Baltimore Schuetzen Park. It was just north of the Wiessner Brewing complex. Across the street from the brewery is the residence of the Wiessner family. It's a three story townhouse with a brick and cast-iron fence. Its large size was strictly functional, for it housed not only the family, but workers newly arriving from Germany. Not only did Wiessner bring immigrants from Germany to work in the brewery, he brought skilled professionals to the area. This transition helped professionals move to Baltimore and helped to stabilize the neighborhood with potential homeowners. The buildings north of the townhouse contained the offices of the brewery. In 1920 the Wiessner Brewery had to close its doors due to prohibition. The Wiessner property was sold to the American Malt Company in 1931. In 1933 prohibition ended and the American Malt Co. started producing again as a brewery until the brewery shut down in 1973. Original brewery complex and buildings taken most likely in the late 1800's. The complex and buildings as they look today. in a niche above the door. A picture of the King when the building that he was on was still standing. The King Gambrinus statue was restored in 2003 and is now housed at the Maryland Historical Society. The building sat empty and decaying for the next 30 some years until Humanim, a Columbia Md non-profit, secured $22.5 million for renovations of the American Brewery Complex into their new headquarters. The City of Baltimore approved the building permit in early 2004 and the work was completed in 2009. The area around the brewery has long been in decline. Many, if not most of the houses are boarded up and there are very few businesses operating in an area that once thrived with industry of many types. The brewery rehab and the prospective rehab of the A. Hoen & Co. building, just a few blocks down, will hopefully bring new vitality and new jobs to this suffering neighborhood. Basketball court at Collington Square Park. The American Brewery tower is in the background. The newly rehabbed American Brewery Building. My uncle Raymond Klussmann was the last brewmaster of this brewery. Did you know him? I grew up in the 2100 block of east Lafayette Ave, and that building was so creepy looking at night- As a little girl, growing up in the 60's-it scared me half to death-at 64 years old-it still does-lol but I am so glad this piece of history has been restored! It was sad to pass by and see it decaying all those years-I only wish the surrounding neighborhood could be restored to the beauty, I remembered as a child!